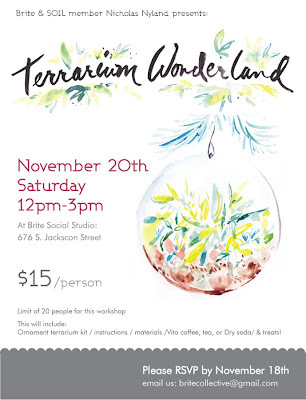 Brite Terrarium Wonderland Workshop, 11/20 this Saturday! WHEN: This SATURDAY, 11/20th, 12-3pm. 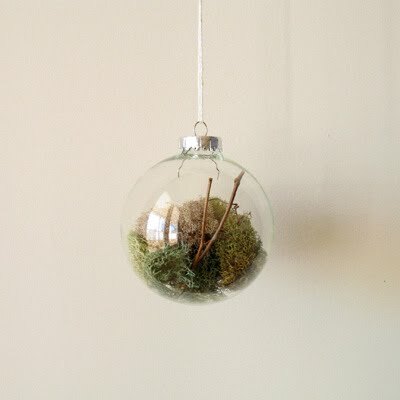 WHAT: You will learn to make lovely terrariums ornaments for the holidays and also make terrariums from found containers! 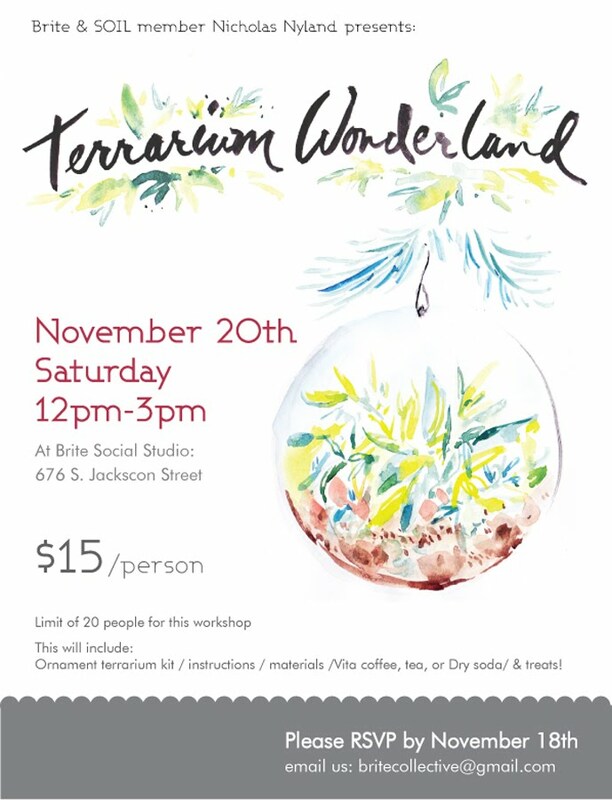 HOW: Pay $15/person, which will include:Terrarium ornament kit/ tools to use/ instructions/ Vita coffee, Tea, or Dry Soda/ Treats/ and good times! Bring your own containers and make more terrariums or donate to the group! Hello! We apologize for the delay!! 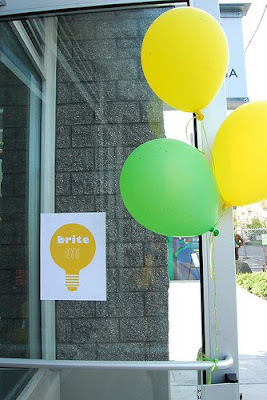 We held our first BRITE event on May, 16. We FINALLY went through the photos (I took 400+ photos!) and can now share with everyone what a fun event it was! 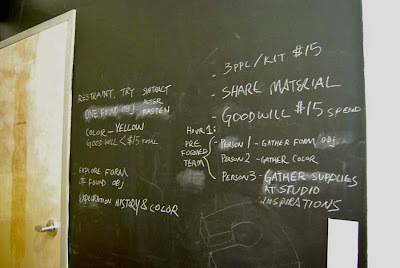 Just to backtrack a little, Dylan & I and Christa & Nin (from Cafe Weekend) teamed up to organize this design charrette (and a trial run) with a mission to start connecting people through interactive and spontaneous design activities. We're calling it the BRITE Collective. 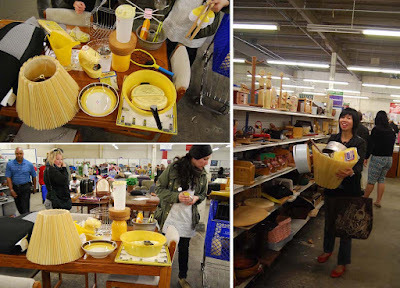 For this first event: BRITE lite, LOCAL DESIGNERS & CRAFTERS teamed up to participate in a spontaneous 4 hour community scavenger hunt/design-build to create ready-made lamps from household and second hand materials. Everyone also got a special wooden BRITE badge! Our plan is to do that for every event! ...I mean , who wouldn't want to be rewarded for such accomplishments! 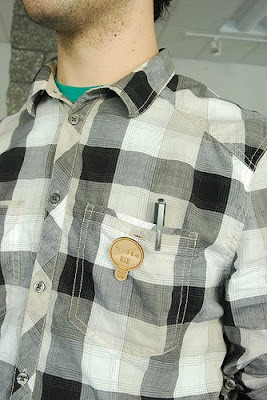 A simple badge is a perfect item that says "HEY! I accomplished something today and that's a wonderful feeling! (blank stare and a giant stiff smile)" And THAT's pretty darn special, wouldn't you agree? We were all about making this event special. 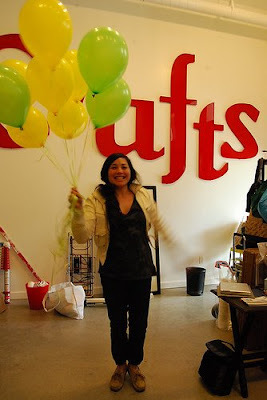 Christa even went and got some cheerful balloons! 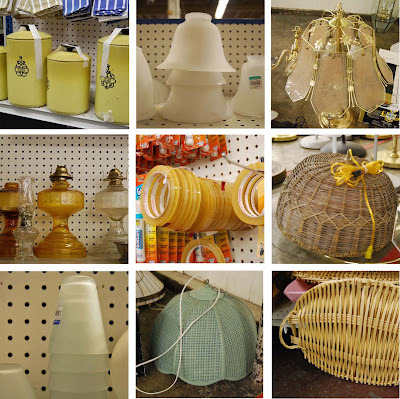 It was a beautiful Seattle day so we were able to open the garage door at the Hiawatha community space and some people worked outside or walked to the nearby Goodwill Dearborn to hunt for interesting materials for their lights. Nin and I were in charge of documentenging the event...we followed people around trying taking candid shots capturing their process at the Goodwill. And in the process of taking photos, I crept around like a creepy stalker trying not to get noticed....and also trying to stop myself from shopping. That was hard. Oh and look! Here's Steve with his new Friend! 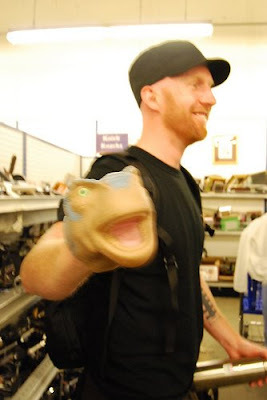 Apparently he decided to replace his hand with a rubber dinosaur head instead. Oh! all the wonderful things you can find! It was so inspiring to creative energy in the room and see everyone brainstorming, sketching, playing ,and exploring with materials. It was just amazing to see everyone use ordinary things and turn it into something extraordinary!! Okay I'll stop with the talking.. On with the results! 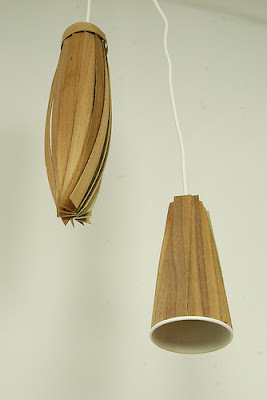 Pair of hanging lights made with walnut edge banding and paper cups by Lindsay & Sena. 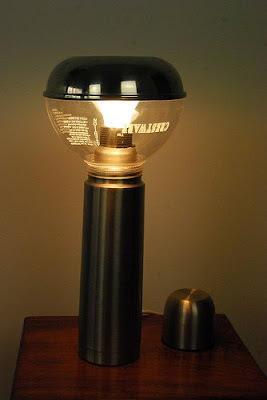 Table lamp made with stainless thermos and glass coffee pot by Joelle & Steve. Hanging shade made with wire ring, staples, and letter envelopes by Mat & Dylan. 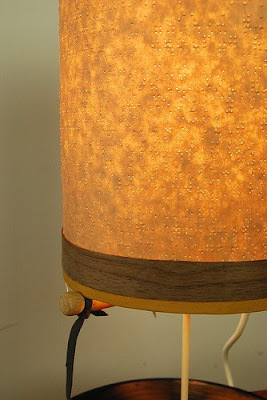 Table lamp wit braille paper and Stevie Wonder record at the base by Christine & Nick. Hanging chandelier made with mix match of magazine organizers by Chika & Cat. Come see TONS more photos here to see the entire process! The lights will also be exhibited at JOIN's Ctrl Alt Design show at Ouch My Eye, beginning June 12th, with the opening starting from 7-midnight. If you like what you're seeing and would like to know about our future events, please join our BRITE facebook ! Thanks to everyone who participated. 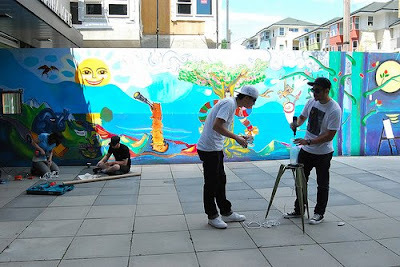 It was a very fun day and great way to kick off the BRITE Collective!! 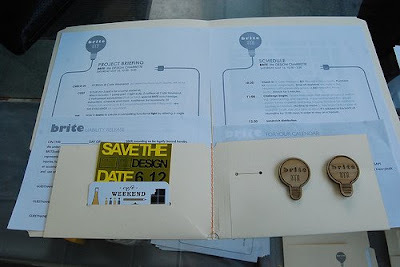 Dylan & I are collaborating with Christa & Nin from Cafe Weekend on a new "arm" of JOIN design Seattle. It will provide a series of spontaneous and fun design events made to stimulate, inspire, and unite the Seattle design community. We're calling it Brite Collective. 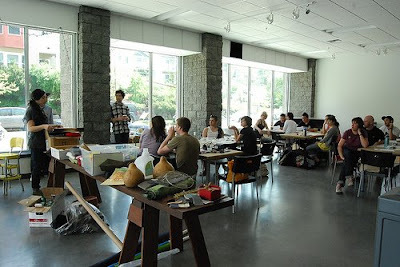 Our first event, a charrette where small teams will create lamp designs from existing objects, will take place this coming Saturday at the Hiawatha Lofts in Seattle. Here's a little preview from a trial run we did together couple Saturdays ago. The trial run was to help us go through the process in order to figure out the details when we host the actual event...it was a TRIAL....it's not us cheating! WE PROMISE YOU! 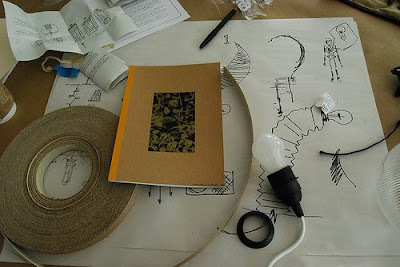 Design a lamp shade with pre-existing object as a team. 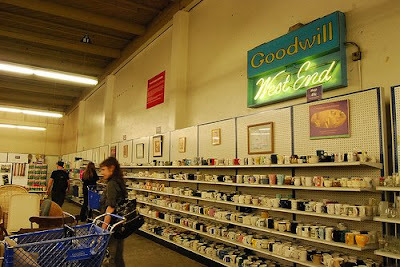 Shop at Goodwill thrift store together and spend no more than $15 total for materials. Incorporate the color yellow. 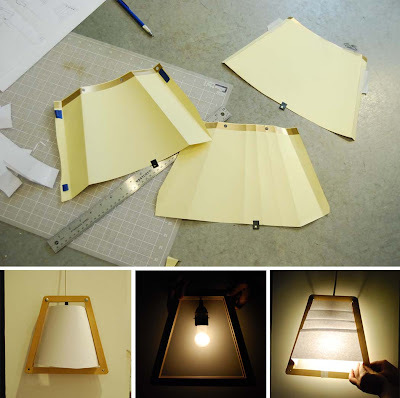 Make a lamp in 3 hours. The process: Went to Goodwill to scavenger hunt. Got some inspiration for forms and materials. We gathered everything and had it out on a table to narrow down our choice. In the mist of all this, random people were looking over our shoulders, and some people actually picked up the things we had and was going to take it! I had to tell them to back off! See that lady on the left?...yeah..can't trust her. She was probably thinking of taking some stuff when we weren't looking! :P Beware...people at Goodwill are very aggressive...I guess its survival of the fittest..or something like that. After spending 1.5 hours at the Goodwill and discussing what we liked and what we can do with each object, we ended up with these items that came to a total of $11.70. 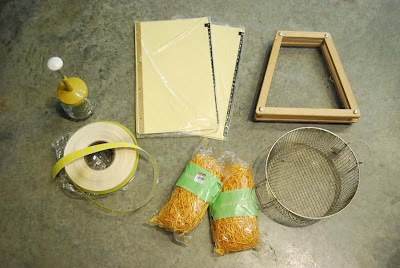 Roll of yellow stickers, 2 bags yellow basket stuffing, yellow jar beater, manila dividers, wire basket, and a tennis frame protector. We all liked the tennis frame since we all thought it looked like a 2D lamp shape. But somehow we convinced ourselves to make a paper mache lamp shade that would mold around the form of a light bulb...big mistake. We started doing that and by that point we were already at 3 hours! At that point, we weren't even close to being done....so we FAILED....We didn't make it in the time line we made for ourselves... 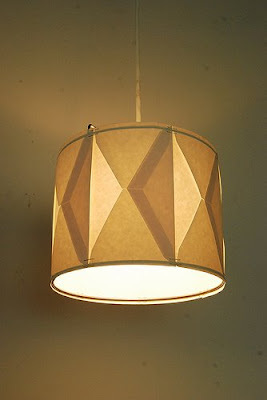 But we decided to just continue on, re-think, simplify, and finished the lamp despite our failure! We picked up the manila dividers and thought to just make that a lamp shade and clamp it in between the tennis frame. 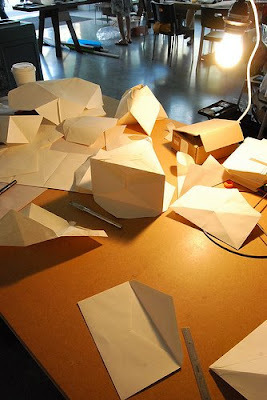 We played around folding and cutting the paper in various shapes. So after two more hours of iterating....Voila! 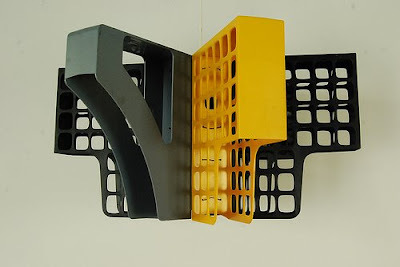 We made a simple light sconce made with only the tennis frame and one sheet of manila divider. If you're interested in subjecting yourself to this kind of fun challenge email info@cafeweekend.com by Wednesday May 13th for more details on attending.